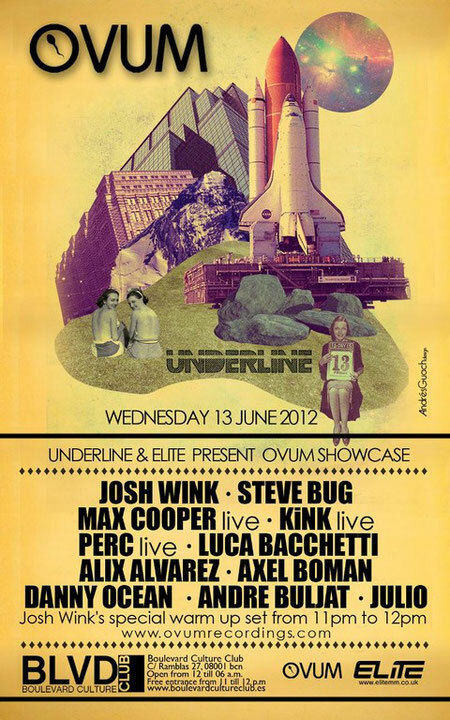 Ovum once again opens Sonar week on Wednesday June 13th at Boulevard. In Room 1, long-time friends and collaborators Josh Wink and Steve Bug will go back2back alongside Ovum artists Luca Bacchetti and Alix Alvarex back2back and Axel Boman, whose remix of Agraric Projects 'No Way I Know I Feel' was one of Ovum's highlights of 2011. In Room 2, Wink will open the first hour for a special warm-up set ahead of his main room set later on, followed by Perc live, Max Cooper live, KiNK live and Andre Buljat, completing the tightly packed line-up of electronic talent. 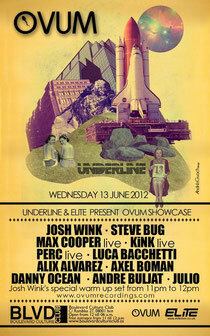 Josh Wink: "Excited to be hosting our 4th Annual Ovum party in Barcelona during Sonar week. It has gained a reputation of being the party to attend to welcome in the Sonar festival, which I feel very happy about. We are proud this year to continue this new tradition and present another amazing and diverse Ovum line up from the label: Steve Bug, Gregor Tresher, Luca Bacchetti, Kink, Perc, Axel Boman & Myself! That's what I'm talking about! I hear a lot of people fly in a day early just to make our party, which makes me happy and I look forward to presenting, representing and having another party go off!"